This attractive and highly creative fusion of retro 1940’s with 21st century free-form styling is one of the hottest new looks for this season! 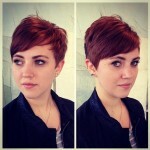 The hair is swept back from the front, without brushing, to create a relaxed, messy look. The sides of the hair are deftly twisted and pinned at the back creating a casual, decorative band above the chignon. The rest of the hair is pinned into a low pony-tail, and then twisted along the length and around the base to make an edgy textured chignon which covers the nape. The concept behind the free-form chignon is that every chignon will be different and individual to the wearer, in a trend that emphasises the beauty of asymmetry! Do you love this updo? Tell us what you think bellow.